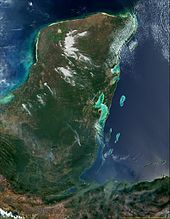 The first encounter with the Yucatec Maya may have occurred in 1502, when the fourth voyage of Christopher Columbus came across a large trading canoe off Honduras. In 1511, Spanish survivors of the shipwrecked caravel called Santa María de la Barca sought refuge among native groups along the eastern coast of the peninsula. Hernán Cortés made contact with two survivors, Gerónimo de Aguilar and Gonzalo Guerrero, six years later. In 1517, Francisco Hernández de Córdoba made landfall on the tip of the peninsula. His expedition continued along the coast and suffered heavy losses in a pitched battle at Champotón, forcing a retreat to Cuba. 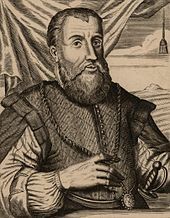 Juan de Grijalva explored the coast in 1518, and heard tales of the wealthy Aztec Empire further west. As a result of these rumours, Hernán Cortés set sail with another fleet. From Cozumel he continued around the peninsula to Tabasco where he fought a battle at Potonchán; from there Cortés continued onward to conquer the Aztec Empire. In 1524, Cortés led a sizeable expedition to Honduras, cutting across southern Campeche, and through Petén in what is now northern Guatemala. 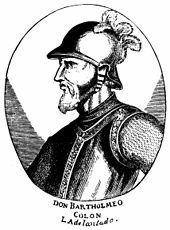 In 1527 Francisco de Montejo set sail from Spain with a small fleet. He left garrisons on the east coast, and subjugated the northeast of the peninsula. Montejo then returned to the east to find his garrisons had almost been eliminated; he used a supply ship to explore southwards before looping back around the entire peninsula to central Mexico. Montejo pacified Tabasco with the aid of his son, also named Francisco de Montejo. In 1531 the Spanish moved their base of operations to Campeche, where they repulsed a significant Maya attack. After this battle, the Spanish founded a town at Chichen Itza in the north. Montejo carved up the province amongst his soldiers. In mid-1533 the local Maya rebelled and laid siege to the small Spanish garrison, which was forced to flee. Towards the end of 1534, or the beginning of 1535, the Spanish retreated from Campeche to Veracruz. In 1535, peaceful attempts by the Franciscan Order to incorporate Yucatán into the Spanish Empire failed after a renewed Spanish military presence at Champotón forced the friars out. Champotón was by now the last Spanish outpost in Yucatán, isolated among a hostile population. In 1541–42 the first permanent Spanish town councils in the entire peninsula were founded at Campeche and Mérida. When the powerful lord of Mani converted to the Roman Catholic religion, his submission to Spain and conversion to Christianity encouraged the lords of the western provinces to accept Spanish rule. In late 1546 an alliance of eastern provinces launched an unsuccessful uprising against the Spanish. The eastern Maya were defeated in a single battle, which marked the final conquest of the northern portion of the Yucatán Peninsula. The polities of Petén in the south remained independent and received many refugees fleeing from Spanish jurisdiction. In 1618 and in 1619 two unsuccessful Franciscan missions attempted the peaceful conversion of the still pagan Itza. In 1622 the Itza slaughtered two Spanish parties trying to reach their capital Nojpetén. These events ended all Spanish attempts to contact the Itza until 1695. Over the course of 1695 and 1696 a number of Spanish expeditions attempted to reach Nojpetén from the mutually independent Spanish colonies in Yucatán and Guatemala. In early 1695 the Spanish began to build a road from Campeche south towards Petén and activity intensified, sometimes with significant losses on the part of the Spanish. Martín de Urzúa y Arizmendi, governor of Yucatán, launched an assault upon Nojpetén in March 1697; the city fell after a brief battle. With the defeat of the Itza, the last independent and unconquered native kingdom in the Americas fell to the Spanish. 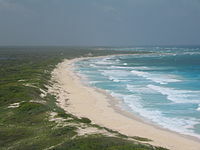 The coast of Cozumel was Grijalva's first sight of Yucatán. ^ Quezada 2011, p. 13. ^ a b c d Quezada 2011, p. 14. ^ White and Hood 2004, p. 152. ^ a b c Thompson 1966, p. 25. ^ a b Quezada 2011, p. 15. ^ Quezada 2011, pp. 14–15. ^ Lovell 2005, p. 17. ^ Sharer and Traxler 2006, p. 46. ^ Sharer and Traxler 2006, pp. 46–47. ^ Sharer and Traxler 2006, p. 47. ^ Rice and Rice 2009, p. 5. ^ a b c Quezada 2011, p. 16. ^ a b Quezada 2011, p. 17. ^ a b Schwartz 1990, p. 17. ^ a b Schwartz 1990, p. 18. ^ a b Estrada-Belli 2011, p. 52. ^ Coe 1999, p. 31. ^ a b c Andrews 1984, p. 589. ^ Sharer and Traxler 2006, pp. 499–500. ^ Sharer and Traxler 2006, pp. 613, 616. ^ Andrews 1984, p. 590. ^ Caso Barrera 2002, p. 17. ^ a b c Andrews 1984, p. 591. ^ Andrews 1984, p. 593. ^ Andrews 1984, p. 592. ^ a b c Sharer and Traxler 2006, pp. 761–762. ^ a b c d Jones 2000, p. 353. ^ Houwald 1984, p. 257. ^ Jones 2000, p. 351. ^ Jones 2000, p. 352. ^ Rice and Rice 2009, p. 10. ^ a b Cecil et al 1999, p. 788. ^ Sharer and Traxler 2006, p. 617. ^ Rice and Rice 2005, p. 149. ^ Rice 2009, p. 17. ^ Smith 2003, p. 279. ^ a b Thompson 1966, p. 24. ^ a b c d Thompson 1966, p. 26. ^ Jones 2000, p. 364. ^ Rice 2009, p. 83. ^ Pugh 2009, p. 191. ^ Houwald 1984, p. 256. ^ a b c d Clendinnen 2003, p. 7. ^ Pohl and Hook 2008, p. 26. ^ Wise and McBride 2008, pp. 33–34. ^ Wise and McBride 2008, p. 34. ^ Sharer and Traxler 2006, p. 758. ^ a b c de Díos González 2008, p. 25. Gómez Martín June 2013, p. 56. ^ Gómez Martín June 2013, p. 56. ^ de Díos González 2008, pp. 25–26. ^ de Díos González 2008, p. 26. ^ a b Clendinnen 2003, pp. 4–5. ^ a b c d Clendinnen 2003, pp. 6. ^ Clendinnen 2003, pp. 5. ^ a b c d Sharer and Traxler 2006, p. 759. ^ a b Clendinnen 2003, p. 8. ^ Clendinnen 2003, pp. 8–9. ^ Clendinnen 2003, p. 9. ^ Clendinnen 2003, pp. 9–10. ^ Clendinnen 2003, p. 10. ^ Clendinnen 2003, pp. 10–11. ^ a b c Clendinnen 2003, p. 11. ^ a b c Clendinnen 2003, p. 12. ^ Clendinnen 2003, pp. 11–12. ^ Clendinnen 2003, pp. 12–13. ^ Clendinnen 2003, p. 13. ^ a b c Clendinnen 2003, p. 14. ^ Sharer and Traxler 2006, p. 759. Clendinnen 2003, p. 14. ^ Sharer and Traxler 2006, p. 759. Recinos 1986, p. 18. ^ Recinos 1986, p. 18. ^ a b c d e Clendinnen 2003, p. 15. ^ a b c d e f g Sharer and Traxler 2006, p. 760. ^ Clendinnen 2003, pp. 14–15. ^ a b Sharer and Traxler 2006, p. 760. ^ Clendinnen 2003, pp. 15–16. ^ Clendinnen 2003, p. 16. ^ Sharer and Traxler 2006, pp. 760–761. ^ Sharer and Traxler 2006, pp. 758–759, 760–761. ^ a b c d Sharer and Traxler 2006, p. 761. ^ a b c d e f Townsend 1995, p. 16. ^ Hernández et al. 2010, p. 26. ^ Townsend 1995, pp. 16ff. ^ a b Sharer and Traxler 2006, p. 766. ^ a b c Jones 2000, p. 358. ^ Rice and Rice 2009, p. 12. ^ Rice et al. 2009, p. 127. ^ Rice and Rice 2005, p. 152. ^ a b c d Sharer and Traxler 2006, p. 762. ^ Sharer and Traxler 2006, p. 773. ^ Sharer and Traxler 2006, pp. 766–767. ^ Sharer and Traxler 2006, p. 767. Clendinnen 2003, p. 20. ^ a b c d e Sharer and Traxler 2006, p. 767. ^ Clendinnen 2003, p. 20. ^ a b Clendinnen 2003, p. 21. ^ Sharer and Traxler 2006, p. 767. Clendinnen 1989, 2003, p. 21. ^ Sharer and Traxler 2006, p. 767. ^ Sharer and Traxler 2006, pp. 767–768. ^ Sharer and Traxler 2006, p. 768. Clendinnen 2003, p. 21. ^ a b c d e f Sharer and Traxler 2006, p. 768. ^ a b Quezada 2011, p. 37. ^ Quezada 2011, pp. 37–38. ^ Clendinnen 2003, p. 23. Sharer and Traxler 2006, p. 768. ^ Sharer and Traxler 2006, pp. 768–769. ^ a b Sharer and Traxler 2006, p. 769. ^ Sharer and Traxler 2006, pp. 769–770. ^ a b c Sharer and Traxler 2006, p. 770. ^ Sharer and Traxler 2006, pp. 770–771. ^ a b c Sharer and Traxler 2006, p. 771. ^ a b c d Sharer and Traxler 2006, p. 772. ^ Caso Barrera 2002, pp. 17, 19. ^ Caso Barrera 2002, p. 19. ^ Fialko Coxemans 2003, pp. 72–73. ^ a b Sharer and Traxler 2006, p. 773. ^ a b c d e f Sharer and Traxler 2006, p. 774. ^ Sharer and Traxler 2006, p. 774. Chuchiak IV 2005, p. 131. ^ Jones 1998, pp. 42, 47. ^ Chuchiak IV 2005, p. 132. ^ Means 1917, p. 79. ^ Means 1917, p. 80. ^ a b Means 1917, p. 81. ^ Means 1917, p. 81. ^ Jones 1998, p. 48. ^ Jones 1998, pp. 48–49. ^ Feldman 2000, p. 151. ^ Jones 1998, pp. 111, 132–133, 145. ^ Jones 1998, pp. 129–130. ^ Jones 1998, pp. 130–131. ^ Jones 1998, p. 131. ^ Jones 1998, pp. 132, 134. ^ Jones 1998, pp. 135–136, 139–140. ^ Jones 1998, p. 141. ^ Jones 1998, p. 140. ^ a b Jones 1998, p. 142. ^ Jones 1998, p. 143. ^ Jones 1998, pp. 130, 144. ^ Jones 1998, pp. 148–149. ^ Jones 1998, p. 147. ^ Jones 1998, p. 154. ^ Jones 1998, p. 163. ^ Jones 1998, p. 162. ^ Jones 1998, pp. 148, 150. ^ Jones 1998, pp. 130, 151–152. ^ Jones 1998, p. 152. ^ Jones 1998, pp. 150, 154. ^ Jones 1998, pp. 154–155. ^ Jones 1998, p. 155. ^ Jones 1998, p. 156. ^ Jones 1998, pp. 148, 157. ^ Jones 1998, p. 157. ^ Jones 1998, p. 148. ^ Jones 1998, p. 158. ^ Jones 1998, pp. 158–159. ^ Jones 1998, pp. 159–160. ^ Jones 1998, p. 160. ^ Jones 1998, pp. 160–161. ^ Jones 1998, pp. 187, 189. ^ Jones 1998, pp. 189–190. ^ Jones 1998, p. 190. ^ a b c Sharer and Traxler 2006, p. 775. ^ Sharer and Traxler 2006, p. 775. ^ Jones 1998, p. 205. ^ Jones 1998, p. 207. ^ Jones 1998, pp. 209–210. ^ Vayhinger-Scheer 2011, p. 383. ^ Sharer and Traxler 2006, pp. 775–776. ^ Jones 1998, pp. 189, 226. ^ Jones 1998, p. 226. ^ Jones 1998, p. 227. Sharer and Traxler 2006, p. 776. ^ Jones 1998, p. 228. ^ a b Jones 1998, p. 229. ^ Sharer and Traxler 2006, p. 776. ^ Jones 1998, pp. 232–233. ^ Jones 1998, p. 233. ^ Jones 1998, pp. 233–234. ^ Jones 1998, p. 479n59. ^ Jones 1998, p. 234-235. ^ Jones 1998, pp. 237–238. ^ Jones 1998, pp. 238–239. ^ Jones 1998, p. 240. ^ Jones 1998, pp. 241–242. ^ a b Jones 2000, p. 362. ^ Jones 2009, p. 59. Jones 1998, pp. 253, 265–266. ^ Jones 1998, pp. 268–269. ^ Jones 1998, pp. 252, 268. ^ Jones 1998, pp. 269–270. ^ Sharer and Traxler 2006, p. 777. ^ Jones 1998, p. 297. ^ Jones 1998, pp. 298–299. ^ a b Jones 2009, p. 59. ^ Sharer and Traxler 2006, pp. 777–778. ^ Sharer and Traxler 2006, p. 778. ^ Jones 1998, p. 295. ^ Jones 1998, p. 306. ^ Jones 1998, p. xix. Athena Review (1999a). "The Spanish Conquest of Yucatán (1526–46)". Athena Review. 2 (1). Retrieved 2006-07-25. Athena Review (1999b). "The Valdivia Shipwreck (1511)". Athena Review. 2 (1). Retrieved 2006-07-25. Caso Barrera, Laura (2002). Caminos en la selva: migración, comercio y resistencia: Mayas yucatecos e itzaes, siglos XVII–XIX [Roads in the Forest: Migration, Commerce and Resistance: Yucatec and Itza Maya, 17th–19th Centuries] (in Spanish). Mexico City, Mexico: El Colegio de México, Fondo de Cultura Económica. ISBN 978-968-16-6714-6. OCLC 835645038. Cervantes de Salazar, Francisco (n.d.) [ca. 1560]. Crónica de la Nueva España (in Spanish). readme.it. Retrieved 2006-07-26. Cecil, Leslie; Prudence M. Rice; Don S. Rice (1999). J.P. Laporte; H.L. Escobedo (eds.). "Los estilos tecnológicos de la cerámica Postclásica con engobe de la región de los lagos de Petén" [The Technological Styles of Postclassic Slipped Ceramics in the Petén Lakes Region] (PDF). Simposio de Investigaciones Arqueológicas en Guatemala (in Spanish). Guatemala City, Guatemala: Museo Nacional de Arqueología y Etnología. XII (1998): 788–795. OCLC 42674202. Archived from the original ( PDF) on 2013-11-02. Retrieved 2012-11-26. Chamberlain, Robert Stoner (1948). The Conquest and Colonization of Yucatan, 1517–1550. Washington, D.C.: Carnegie Institution. OCLC 459181680. Chuchiak IV, John F. (2005). ""Fide, Non Armis": Franciscan Reducciónes and the Maya Mission Experience on the Colonial Frontier of Yucatán, 1602–1640". In John F. Schwaller (ed.). Francis in the Americas: Essays on the Franciscan Family in North and South America (PDF). Berkeley, California, US: Academy of American Franciscan History. pp. 119–142. ISBN 0-88382-306-3. OCLC 61229653. Archived from the original (PDF) on 2013-10-15. Coe, Michael D. (1987). The Maya (4th edition (revised) ed.). London; New York: Thames & Hudson. ISBN 0-500-27455-X. OCLC 15895415. Coe, Michael D. (1999). The Maya. Ancient Peoples and Places (6th edition, fully revised and expanded ed.). London, UK and New York, US: Thames & Hudson. ISBN 0-500-28066-5. OCLC 59432778.
de Dios González, Juan (2008). "Gonzalo Guerrero, primer mexicano por voluntad propia" [Gonzalo Guerrero, First Mexican by his Own Free Will] (PDF). Inventio: la génesis de la cultura universitaria en Morelos (in Spanish). Cuernavaca, Morelos, Mexico: Universidad Autónoma del Estado de Morelos (4): 23–26. OCLC 613144193. Retrieved 2013-12-17. Estrada-Belli, Francisco (2011). The First Maya Civilization: Ritual and Power Before the Classic Period. Abingdon, Oxfordshire, UK and New York, US: Routledge. ISBN 978-0-415-42994-8. Fialko Coxemans, Vilma (2003). "Domingo Fajardo: vicario y defensor de indios en Petén. 1795–1828" [Domingo Fajardo: Vicar and Defender of Indians in Petén] (PDF). Mayab (in Spanish). Madrid, Spain: Sociedad Española de Estudios Mayas (16): 72–78. ISSN 1130-6157. OCLC 14209890. Retrieved 2012-12-06. Gómez Martín, Jorge Angel (June 2013). "El Descubrimiento del Yucatán" (PDF). Revista de Estudios Colombinos (in Spanish). Tordesillas, Valladolid, Spain: Seminario Iberoamericano de Descubrimientos y Cartografía (9): 53–60. ISSN 1699-3926. OCLC 436472699. Retrieved 2013-12-17. Hernández, Christine; Anthony P. Andrews; Gabrielle Vail (2010). "Introduction". In Gabrielle Vail; Christine L. Hernández (eds.). Astronomers, Scribes, and Priests: Intellectual Interchange Between the Northern Maya Lowlands and Highland Mexico in the Late Postclassic Period. Dumbarton Oaks Pre-Columbian symposia and colloquia. Washington, D.C, US: Harvard University Press. pp. 17–36. ISBN 9780884023463. OCLC 845573515. Houwald, Götz von (1984). "Mapa y Descripción de la Montaña del Petén e Ytzá. Interpretación de un documento de los años un poco después de la conquista de Tayasal" [Map and Description of the Jungle of Petén and Itza. Interpretation of a Document from the Years Soon After the Conquest of Tayasal] (PDF). Indiana (in Spanish). Berlin, Germany: Ibero-Amerikanisches Institut (9). ISSN 0341-8642. OCLC 2452883. Retrieved 2012-12-03. INAH (2010). "Zona Arqueológica El Meco" (in Spanish). Mexico City, Mexico: Instituto Nacional de Antropología e Historia (INAH) and Consejo Nacional para la Cultura y las Artes (CONACULTA). Archived from the original on 2013-08-23. Retrieved 2013-12-07. Guatemala (Map) (3rd ed.). 1:500000. International Travel Maps. Richmond, British Columbia, Canada: ITMB Publishing. 1998. ISBN 0-921463-64-2. OCLC 421536238. México South East (Map) (2nd ed.). 1:1000000. International Travel Maps. Richmond, British Columbia, Canada: ITMB Publishing. 2000. ISBN 0-921463-22-7. OCLC 46660694. Jones, Grant D. (2009). "The Kowoj in Ethnohistorical Perspective". In Prudence M. Rice; Don S. Rice (eds.). The Kowoj: Identity, Migration, and Geopolitics in Late Postclassic Petén, Guatemala. Boulder, Colorado, US: University Press of Colorado. pp. 55–69. ISBN 978-0-87081-930-8. OCLC 225875268. Means, Philip Ainsworth (1917). History of the Spanish Conquest of Yucatan and of the Itzas . Papers of the Peabody Museum of American Archaeology and Ethnology, Harvard University. VII. Cambridge, Massachusetts, US: Peabody Museum of Archaeology and Ethnology. OCLC 681599. Perramon, Francesc Ligorred (1986). "Los primeros contactos lingüísticos de los españoles en Yucatán". In Miguel Rivera; Andrés Ciudad (eds.). Los mayas de los tiempos tardíos (PDF) (in Spanish). Madrid, Spain: Sociedad Española de Estudios Mayas. pp. 241–252. ISBN 9788439871200. OCLC 16268597. Pugh, Timothy W. (2009). "Residential and Domestic Contexts at Zacpetén". In Prudence M. Rice; Don S. Rice (eds.). The Kowoj: Identity, Migration, and Geopolitics in Late Postclassic Petén, Guatemala. Boulder, Colorado, US: University Press of Colorado. pp. 141–191. ISBN 978-0-87081-930-8. OCLC 225875268. Quezada, Sergio (2011). La colonización de los mayas peninsulares [The Colonisation of the Peninsula Maya] (PDF). Biblioteca Básica de Yucatán (in Spanish). 18. Merida, Yucatan, Mexico: Secretaría de Educación del Gobierno del Estado de Yucatán. ISBN 978-607-7824-27-5. OCLC 796677890. Archived from the original (PDF) on 2013-11-04. Retrieved 2013-01-20. Rice, Prudence M. (2009). "The Archaeology of the Kowoj: Settlement and Architecture at Zacpetén". In Prudence M. Rice; Don S. Rice (eds.). The Kowoj: Identity, Migration, and Geopolitics in Late Postclassic Petén, Guatemala. Boulder, Colorado, US: University Press of Colorado. pp. 81–83. ISBN 978-0-87081-930-8. OCLC 225875268. Rice, Prudence M.; Don S. Rice (2009). "Introduction to the Kowoj and their Petén Neighbors". In Prudence M. Rice; Don S. Rice (eds.). The Kowoj: Identity, Migration, and Geopolitics in Late Postclassic Petén, Guatemala. Boulder, Colorado, US: University Press of Colorado. pp. 3–15. ISBN 978-0-87081-930-8. OCLC 225875268. Rice, Prudence M. (2009). "Who were the Kowoj?". In Prudence M. Rice; Don S. Rice (eds.). The Kowoj: Identity, Migration, and Geopolitics in Late Postclassic Petén, Guatemala. Boulder, Colorado, US: University Press of Colorado. pp. 17–19. ISBN 978-0-87081-930-8. OCLC 225875268. Rice, Prudence M.; Don S. Rice; Timothy W. Pugh; Rómulo Sánchez Polo (2009). "Defensive architecture and the context of warfare at Zacpetén". In Prudence M. Rice; Don S. Rice (eds.). The Kowoj: identity, migration, and geopolitics in late postclassic Petén, Guatemala. Boulder, Colorado, US: University Press of Colorado. pp. 123–140. ISBN 978-0-87081-930-8. OCLC 225875268. Romero, Rolando J. (1992). "Texts, Pre-Texts, Con-Texts: Gonzalo Guerrero in the Chronicles of Indies" (pdf). Retrieved 2006-07-26. Rugeley, Terry L. (1996). Yucatan's Maya Peasantry and the Origins of the Caste War. Austin: University of Texas Press. ISBN 0-292-77078-2. Smith, Michael E. (2003) . The Aztecs (2nd ed.). Malden, Massachusetts, US and Oxford, UK: Blackwell Publishing. ISBN 978-0-631-23016-8. OCLC 59452395. Townsend, Richard F. (1995) . The Aztecs. London, UK: Thames and Hudson. ISBN 0-500-27720-6. OCLC 27825022. Vayhinger-Scheer, Temis (2011) . "Kanekʼ: El Último Rey Maya Itzaj" [Kanekʼ: The Last Itza Maya King]. In Nikolai Grube (ed.). Los Mayas: Una Civilización Milenaria [The Maya: An Ancient Civilization] (in Spanish). Potsdam, Germany: Tandem Verlag. pp. 382–383. ISBN 978-3-8331-6293-0. OCLC 828120761.